– все поверхности из листового металла, подверженные коррозии, имеют оцинковку. – съемные передние крылья с болтовым креплением. – над полом багажного отделения. Также используйте герметик для зажимных фланцев, соответствующий спецификации для изоляции наружных отверстий для зажимов молдингов, лобового стекла, заднего окна и боковых окон-форточек. 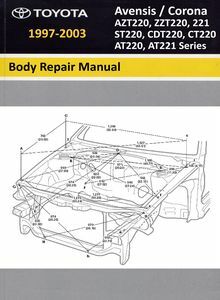 This repair manual has been prepared to provide essential information on body panel repair methods (including cutting and welding operations, but excluding painting) for the TOYOTA AVENSIS/CORONA FWD. This manual consists of body repair methods, exploded diagrams and illustrations of the body components and other information relating to body panel replacement such as handling precautions, etc. 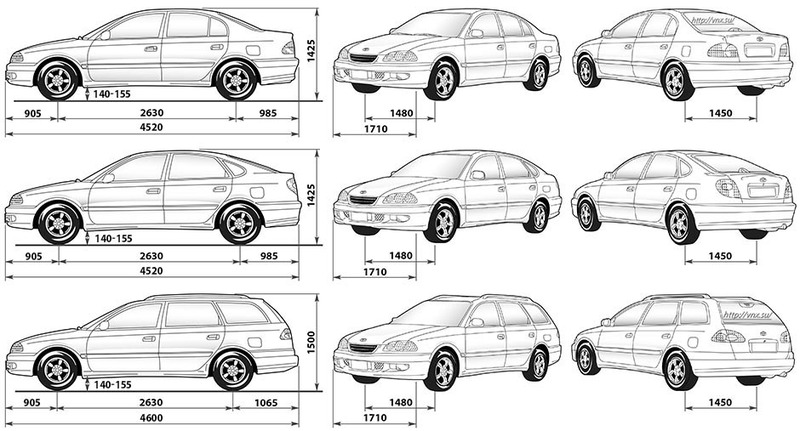 However, it should be noted that the front fenders of the TOYOTA models is bolted on and require no welding. When repairing, don’t cut and join areas that are not shown in this manual. Only work on the specified contents to maintain body strength. Body construction will some times differ depending on specifications and country of destination. Therefore, please keep in mind that the information contained herein is based on vehicles for general destinations. For the repair procedures and specifications other than collision-damaged body components of the TOYOTA AVENSIS/ CORONA FWD refer to the repair manuals.